Amenities like free internet a 24-hour gym and a locale within walking distance to Cameron University shine bright at the non-smoking pet-friendly Candlewood Suites Lawton-Fort Sill. Guests at the four-story Candlewood Suites stay comfy in a choice of 113 rooms furnished with full kitchens DVD players free high-speed internet access and cable TV. The hotel also provides a snack shop for purchasing treats and barbecue facilities for grilling up some fun. Sporty types can get in a workout any time of day thanks to the 24-hour fitness room. 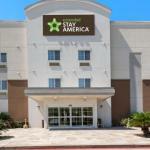 The hotel also provides an on-site business center and coin-operated laundry facilities. Pets are welcome for an additional fee. Located 10 minutes from Central Mall nestled in the heart of Lawton the Candlewood Suites lies just over a half-mile north of Cameron University. Guests can view the works in the Museum of the Great Plains and Comanche National Museum and Cultural Center by heading 10 minutes east. The hotel sits within 15 miles of Wichita Mountains Wildlife Refuge and six miles north of Lawton-Fort Sill Regional Airport.